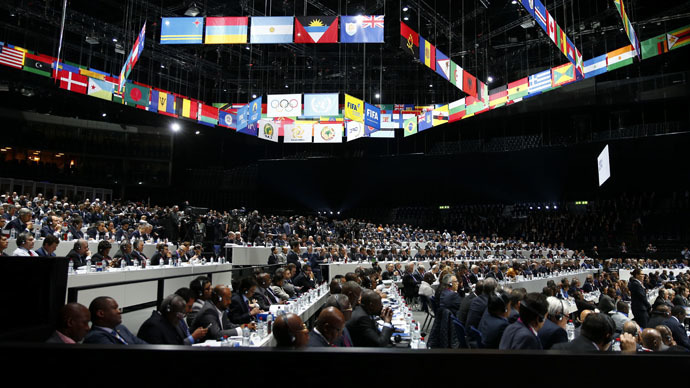 A bomb threat was received at the FIFA congress in Zurich on Friday, prompting authorities to search the meeting venue. No evacuations were carried out, and the congress later resumed. It comes as the organization holds its presidential election. Zurich police said the anonymous bomb threat was made by telephone to a Zurich-based newsroom, and that the congress room was searched. Police spokeswomanBrigitte Vogt earlier confirmed to AFP that a bomb alert had been received at the venue, and that officers were at the scene. No one was evacuated, but congress participants were initially denied re-entry into the auditorium while authorities conducted a search, a witness told Reuters. "A search was carried out. The premises have been cleared by the authorities," FIFA Secretary General Jerome Valcke told the congress after it resumed. Journalists were also allowed back in the building. The FIFA presidential election is set to take place on Friday, with many calling for current president Sepp Blatter to step down following the corruption investigation into several of the organization's officials. However, Blatter is expected to be re-elected for a fifth five-year term. Protests have been taking place outside the meeting venue on Friday, with pro-Palestinian demonstrators calling for Israel's suspension from FIFA. The vote on Israel's status was set to be held on Friday at the request of Palestinians, who complain about restrictions on training and competition.